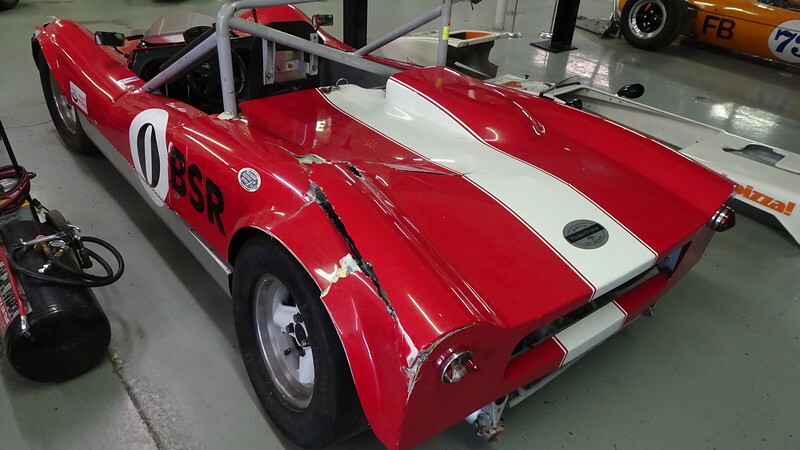 Sadly, Diane's beloved Miller Sports Racer had a freak "incident" at our Race Against Kids' Cancer in August of 2018. You ain't gonna' believe this; it got rolled being towed back to the pits. Long sad story. Knackered it pretty good, all body work and frame were damaged. Diane was unhurt because she remained fully belted up in the car! It was decided to simply do another full ground up restoration on the car. A full restoration was done back in 2000, but that was 18 years ago now (Can't believe it!). Since then Diane has done 100 plus race weekends on the car! So rather than just patch up the damage, it will be taken down to the bare frame to refresh everything. This gallery follows that project. When it rolled, the body work took a hits on all four corners. The big body damage was to the left rear, actually caused when the car rolled backwards into the tow truck after rolling. That little insult to injury also broke the left rear upright, bent trailing arms, the shock. All easily repaired or replaced.